One not uncommonly comes across the opinion today that India was never really a nation but that its nationhood was only recently invented by the British through their definition of the region as part of their empire. Similarly we are told that Hinduism was up to recently not a religion at all but merely various local cults and that Hinduism as a single religion was an idea developed along with the idea of India as a nation that as a religion Hinduism is basically a creation of modern political interests. These ideas are often used to discredit India as a real country or Hinduism as a valid religion. They are used by Marxist and leftist elements or by non-Hindus to draw Hindus into their fold. However, such ideas are clearly refuted by the most important work of literature that we have from India, the Mahabharata. The Mahabharata of 1,000,000 verses dates from at least two thousand years ago, though portions of it are much older, and its actual occurrence may date far longer (see “A Search for the Historical Krishna“). A version of it was noted in the Tamil Nadu region of South India as early as the first century BC. Mahabharata literally means “Great India” as Bharata is the traditional name for India. The Mahabharata presents peoples from the entire subcontinent of India. The story centers on the conflict between the Kauravas and Pandavas, who were members of the same ruling family of the Kuru-Panchala kingdom which extended through the Ganga-Yamuna region. The mother of the Kauravas was Gandhari of Gandhara, which is now Pakistan and northeast Afghanistan.The mother of the Pandavas was Kunti of the Yadava line of what would now be Madhya Pradesh. The Pandavas were allied with Krishna who was originally a king of Mathura on the Yamuna south of Delhi, but moved his capital to Dwaraka in the southern part of his kingdom in Gujarat. Krishna’s main enemy Jarasandha, King of Magadha (Bihar). Kings of all India participated in the Mahabharata war including from Pragjyotish (Assam) and Sind. In their pilgrimages (tirthayatras) And victory marches (digvijayas) the Pandavas traveled all over India from Afghanistan in the west, to Tibet in the north, Assam in the east, to Kanya Kumari in the south. Sri Lanka is also mentioned. Whether the Mahabharata is an historical account or a mere story makes no difference in this issue. The existence of such a story factually or on a literary level proves the same thing-that the idea of the subcontinent of India as a cultural unit clearly existed at a time contemporaneous with the Roman empire-long before any of the modern nation-states had come into being and long before most of Europe was even populated. 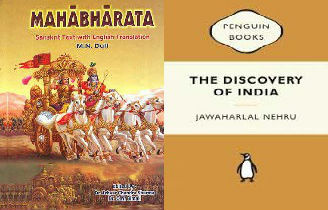 The Mahabharata reflects that India as a cultural unit already formed some two thousand years ago. In this regard no nation, subcontinent or religion has an epic of such proportion or which reflects the integration of such a large region as India through the Mahabharata. There is no such epic as Great Europe or Great China. There is no great epic of Christianity or Islam that encompasses such a clearly defined cultural region which still exists today. Based on the evidence of the Mahabharata it could be argued that India is perhaps the oldest surviving nation in the world. It is the same case with Hinduism as a religion. Hinduism as we know it today is basically the same religion taught in the Mahabharata. The Mahabharata presents a synthesis of the worship of the great Hindu Gods of Shiva, Vishnu and the Goddess (Devi), as well as the related figures of Ganesh, Skanda, and Surya. Their worship is integrated and includes a respect for the Vedas, the Vedic Rishis and the Upanishads, which includes the great truths of Vedanta. The Mahabharata makes Krishna into a great teacher and avatar as well as recognizes Rama and the other avatars of Vishnu. The Mahabharata presents a synthesis of the teachings of Vedanta, Sankhya and Yoga. It contains teaching on the duties of kings, classes and stages of life, medicine and astrology. In fact it compasses all the domains of knowledge and all the issues of human life and culture. It is not just a religious book but the document for an entire civilization. Interestingly the Mahabharata does not present itself as a new religion or cultural document but as a development of the older Vedic tradition. Kings and sages are mentioned from such diverse regions as Gandhara (Afghanistan), Videha (eastern Bihar and Nepal) and Vidarbha (Maharashtra). This is a considerably larger region than the Bible which reflects mainly the people of the small country of Palestine or the Koran which reflects and Arabs of Mecca and Medina. The Vedas also present a much great diversity of personages, with many great sages and yogis, rather than a few prophets only. We must note that when the Mahabharata was first televised in India, the entire country was mesmerized. Trains stopped. Government offices were closed to allow people to watch the program. A comparable phenomenon has never occurred in the West when films of the Bible were shown on television, not has any other national epic so gripped the attention of any country. This shows that the Mahabharata still unites the country and is indeed a national epic. Those who would deny any real history to India as a nation or Hinduism as a religion have only to look at the Mahabharata to see the absurdity of their views. Even the title of the book challenges their view.